Do you ever wish to add a private messaging system on your website? No matter, whether you run a blog or a forum website. Creating a more connected community within your website is important. Enabling your users to send private messages to the other users or to the admin. Consequently, enhances the user-engagement of your website. 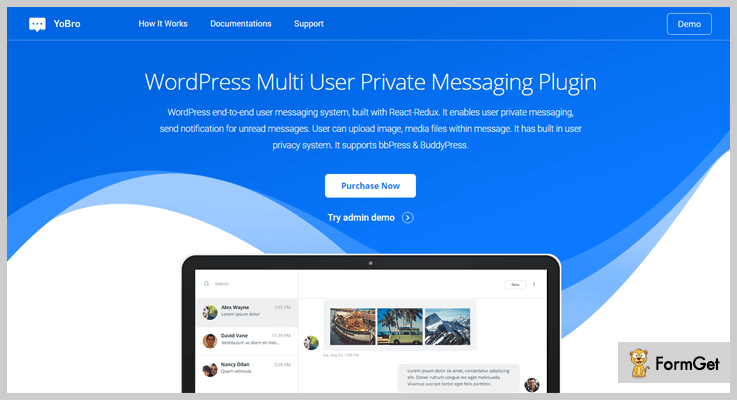 So, we’ve compiled a list of some of the best private message WordPress plugins that help you to create an amazing messaging or chat system on your WordPress website along with private messaging functionality. These plugins provide you the facility to create group messaging system with 100% privacy control. Moreover, through these plugins, users can attach audios, videos, and some other files in their messages. If you really want to create a connectivity between users and admin. Then, adapting these plugins is the best way to interact with each other. It is a highly powerful chat plugin for WordPress. It requires no additional server to set up. Chat is aligned on the right side of your website like Facebook. This plugin has lots of advanced features. 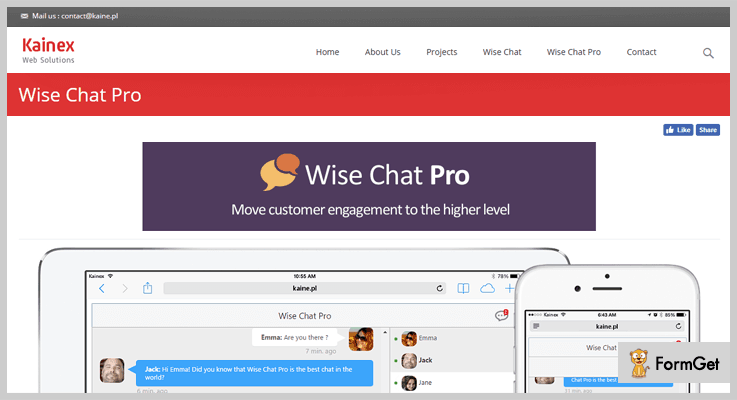 Wise Chat Pro supports multiple chat rooms with bad words filtering. Besides this, it offers private message functionality also. You can allow your users to have one to one conversation and ignore unwanted users. You can purchase this private message plugin at just $39 in which you’ll get custom emoticons, predefined templates, unlimited users, and channels etc. It is integrated with BuddyPress so that you can build up your social community within your website. The plugin assimilates social networking platforms in order to authenticate the users. It automatically sends an email notification to the admin when a new message is posted in the chat. No separate credentials are required for sign up in the chat. Once the users are registered on your website they are allowed to access the chat. This plugin also supports Youtube videos, you can attach it with your messages. File attachment option is also there, so your visitors can send files through the chat. For more amazing features, click on the button below. Private Message WordPress plugin enables your site visitors to send private messages to the other users or to the admin. If you want a perfect front-end messaging system for your website then, you can go for this. This plugin will provide separate inbox and sent box to each user of your site. Further, you can add the email address of the admin to receive private messages. For one site: You’ll have to pay $22 for this. Unlimited sites: It will cost you only $49. The authenticated users of your website can send private messages to the other users or admin using their “Username”. Flexibility to enable/disable messaging between the users and the website admin. Admin can control the message limits for different user roles. Front-end inbox for management of messages. It is a great private message addon specifically for the UserPro WordPress plugin. UserPro is the best user profiles and instant community plugin. To access its private messaging add-on you must have at least UserPro v1.0.77. This plugin allows the users to initiate chats and communicate with each other with lots of features like emoticons, AJAX new message notifications, and broadcast messages etc. 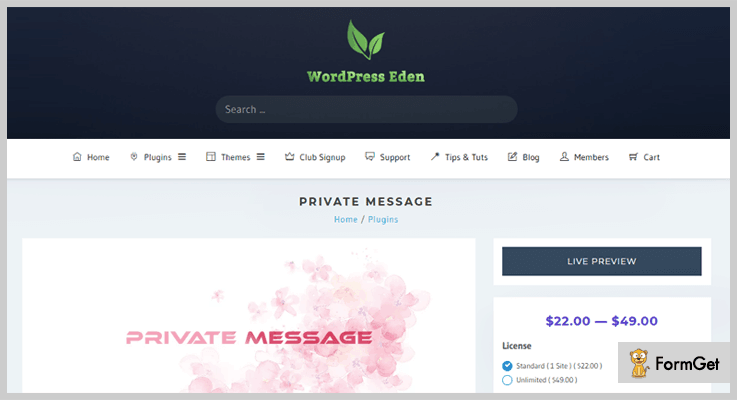 This private message WordPress plugin cost you only $15 on purchasing it from the codecanyon.net. It automatically sends a notification to users when the new message arrives. You can trigger message from any custom link. You can add a custom note, that will be inserted on the footer section of all the private messages. It gives you the facility to block or unblock the users from messaging. Admin can restrict users from broadcasting. Allow only limited members to broadcast. 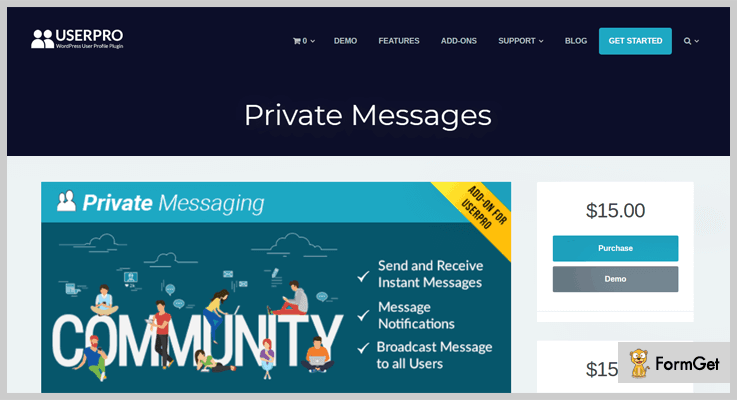 YoBro is premium private message WordPress plugin built with the React-Redux framework. The plugin provides you the seamless end-to-end messaging system. It enables your user to chat privately on your website. This plugin has an inbuilt well designed and organized privacy control system. So, you don’t have to worry about your private messages. If you liked this plugin and want to buy it then, you can purchase it from the codecanyon.net at cost of $22. AWS S3 file storing facility is provided. So, you can store your attachments or messages on save server space. It is a well-designed plugin that will give pixel perfect interface. Real-time message notification system automatically notifies for unread messages. It will also give you the ability to delete messages. The Ajax Private Message WordPress Plugin is powered by AJAX and jQuery. It provides a complete messaging solution by combining the inbox and outbox like Facebook. The plugin also facilitates you by providing auto scroll and auto-suggestions for the username. It is easy to set up and offers a simple and fast interface. You can download this plugin from codecanyon.net at a price of $11 only. The plugin is translation ready that means it can be translated to any primary language of yours. It supports pagination feature and options page. Offers separate and well-organized table in the database for better performance and operations. Search the users by their username (AJAX Search Suggestions) and with a click, it opens a new chat window and starts interacting. 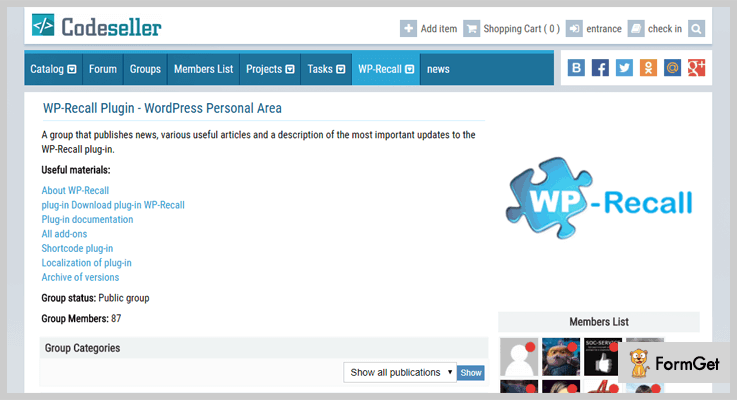 This plugin lets the users of your website communicate with each other, launch interest groups, interact within the forums and community etc. It gives the user ability to personalize their profile and make online orders and much more. In no cost, this plugin provides such great functionalities like forums, rating system, personal and private chat, front-end user login registration. It is available as free of cost, download it from WordPress.org. Customizable user profiles, create your amazing profiles via drag and drop the fields as per your need. It gives you the free WooCommerce integration, to sell products or to create the business or e-commerce store. It also has a user avatar uploader, you can also create custom avatars. The plugin is integrated with PrimeForum, it is lightweight WordPress forum add-on. 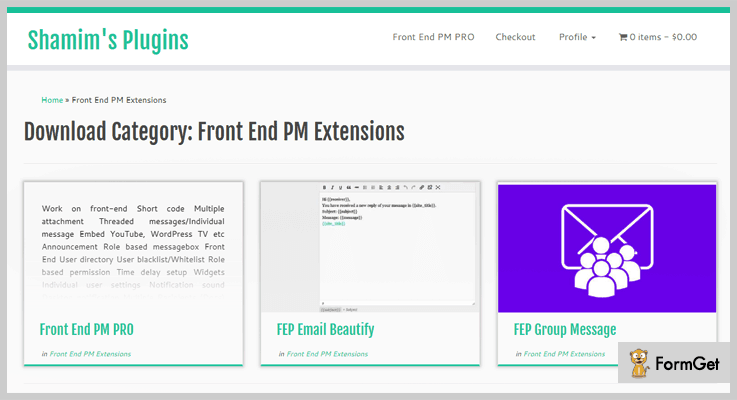 Front End PM is a free WordPress plugin that allows you to create a fully functional messaging system on your website. All the messaging is done from the front-end, there is no need to stuck up at the back end complications. It is a very simple and easy to use a plugin to create an online chat system on your website. Moreover, it also allows your users to have a group chat or they can embed the things like audio, Youtube video, Flickr, WordPress TV and more in the messages. Free to download, available on the official WordPress website. Admin has the power to set how many messages to show per page in the message box. Users can enable or disable the notifications received when the new message arrives. The website users will get the facility to block the other users. Admin can see the private messages of all the users. Further, admin can block the user to send private messages. So, that’s all we have on private message WordPress plugins. We’ve mentioned free as well as paid plugins along with their additional functionalities. If you want to explore the listed private message plugins for WordPress then, you can click on the button given right below them and pick the one that satisfies your requirements. Hopefully, you’ve liked this post. Comment down, if you have any suggestions and queries.